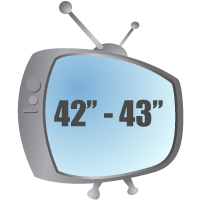 Designed to fit a 40 to 43 inch LCD, LED or Plasma TV, Actual Dimensions: 38" W. x 22.8" H. 1/4" Thick. 42-Inch TV Screen Protector comes standard with shock absorbing felt pads and Velcro straps. Clear rubber bumpers for the 40 to 43 inch TV screen protector available on request for medical use. Protects TVs or Monitors from: 42" to 43"
Please check the size of our TV protector screen against your monitor/TV size to insure it will fit to your satisfaction. If it does not and if the size is close to what you need please give us the size you would like us to make in the comments section with either the measurements or the Make & Model number of the display at checkout. Some TV's have projections on the top edge for a camera, we can cut the bend out in that area at your request to allow the camera to be seen. We can cut our TV and monitor protectors custom on our laser cutter and usually without any delay in shipping. Custom protectors are not returnable for size issues however. This is our first TV Armor purchase and we love it. Wish we had known about this before our daughter hit our brand new flat screen with whatever she hit it with as we do not know. But after some research we found this site and ordered some protection for our new tv and it is working wonderfully. No more worrying if we are going to have a repeat of the first tv. I was looking for a way to make a TV "shatter proof" for my mother, who has dementia. I exchanged several emails with Tim and I am very pleased with the customer service and the product we received. It was easy to install and looks great. Thank you for all of your help and I will let you know if she ever decides to test the product. this has been a godsend it works great when you have three grandsons living with you, the only problem i had so far is one of the boys stuck a coathanger in between tv and screen protector,boys will be boys i guess i would recormend this product.just dont have a lamp or computer directly in front of it across from room will have glare. We purchased this because our 2 year old threw a toy at our previous tv and cracked the crystals inside it. This protector is a little larger than the actual tv, but would fit perfectly for a 42". I like it a little bigger, myself, because it adds to the protection of the tv. Our son has already thrown something at the tv again, and it protected it! We have had several people over since and they didn't even know it was on there. Great purchase and very satisfied customer! After the first tv was damaged by a flying toy truck, I decided it was smart to protect the next tv. In just a few minutes I had the screen protector installed and you can hardly tell it is there. I'm extremely pleased, I only wish I had purchased a screen protector prior to the flying truck! This is our first TV-Armor purchase. We have bought from CLARIVUE and they have not withstood the test of time- scratch easily and even broke on impact. Also, the panel only uses velcro to attach- you get what you pay for... The TV-Armor is much thicker, mounts easily and securely, and no issues with glare in a busy O.R. We will buy again!